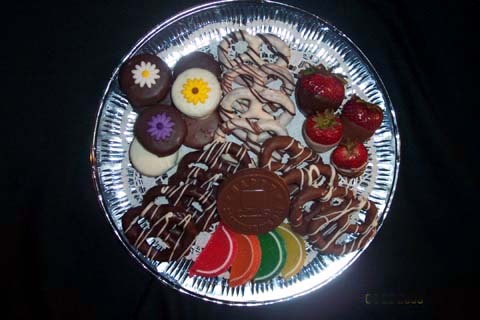 A platter filled with an assortment of milk, dark and white hand-dipped oreos (7), chocolate covered pretzels (12), chocolate covered strawberries (4), fruit slices (4) and Happy Secretary's Day medallion. Beautifully wrapped in clear cellophane and finished with our signature satin ribbon or flowers. Christmas Platter - Small 12"
Gourmet Snack Platter - Small 12"
A platter filled with an assortment of milk, dark and white hand-dipped oreos, double dipped pretzel twists, almond buttercrunch and chewy turtles. Beautifully wrapped in clear cellophane and finished with our signature satin ribbon or flowers. All items can be designed for any occasion such as Easter, Valentine's Day, St. Patrick's Day, Halloween, Thanksgiving, Christmas, Baby Showers, Wedding, Birth, Get Well, etc. Hanukah Platter - Small 12"